Trauma-free anti-aging replaces microderm procedures. Ttrauma-free Skin Renewal Regimen. Restores skin by stimulation of sub-dermal fibroblast cells to respond normally to make new collagen as they do when surface skin trauma occurs, yet without the trauma. What is collagen? Collagen is a type of protein, found throughout the body, that provides the fundamental, lattice-work foundation structure to the skin. Responsible for the good texture, shape, and suppleness of the skin, it keeps your skin young and healthy. Collagen is degraded by aging, sunlight, wind, cold and pollution. Its destruction results in thin, dry and wrinkled skin. Collagen injections have been used in cosmetic surgery to help the skin regain its youthfulness. (The molecule is too big to cross the skin barrier alone, other than by injection, so a collagen mask doesn't really penetrate the skin.) Injectable collagen comes from beef so a doctor must first perform an allergy test by injecting a small amount of collagen in the forearm. Those who are allergic can’t have cosmetic collagen injections, and people with diseases such as lupus, rheumatoid arthritis and psoriatic arthritis are also exempted. Collegen injections are expensive and collagen must be re-injected periodically since the body gradually clears the foreign material over months. 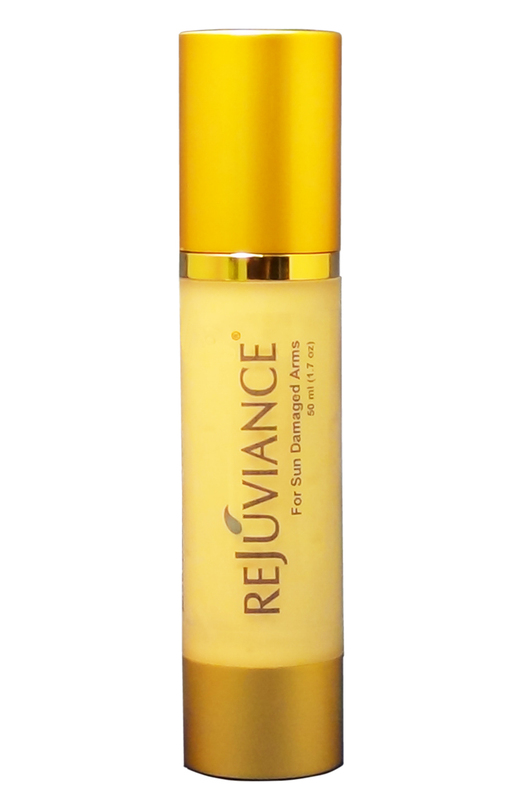 ReJuviance Skin Renewal Cream works differently. With this anti-aging skin cream there are no injections. Instead, it stimulates the body to replace degrading collagen with your own natural human collagen made from within. The fibroblast, found in human subdermal skin, is the most common cell that creates collagen. ReJuviance transdermal technology delivers the small molecule nutrients across the skin barrier to encourage the fibroblasts to replenish new human collagen and proteoglycans for damaged skin renewal. The formula also contains a soothing moisturizer to rehydrate layers beneath outer skin, restoring youthful appearance. It's perfect to repair sun-damaged skin on your arms from years of exposure. Topical application. Place a moderate amount onto your fingertips. Apply evenly to skin on your face . Quickly dries in minutes. For daily use. You may leave in place until next washing. Purified Water, Glycerin, Glyceryl monostearate / Polyoxy-ethylene stearate, Sodium acrylate / acryloyldimethyl taurate copolymer / isohexadecane / polysorbate 80, Alpha Lipoic Acid, Rose Hip Oil , Centella asiatica, Grapeseed Oil, Beta-Sitosterol ester, Tocopheryl Acetate (Vitamin E), Polysorbate 20, Dimethyl Isosorbide, 1-hexadecanol, Camellia sinensis (white tea) extract, L-Ascorbyl palmitate (Vitamin C), Triethanolamine NF, Amino Acids, Benzylalcohol-Dehydroacetic Acid, Fragrance.